1 Bell Ringer Identify the subjects and verbs of the following sentences: Patrick listened to his iPod while the teacher was giving a lesson. When reviewing for our test, Hannah is always right. Lydia is short and cannot reach the top shelf. John quickly completed his homework so he could go outside and play. 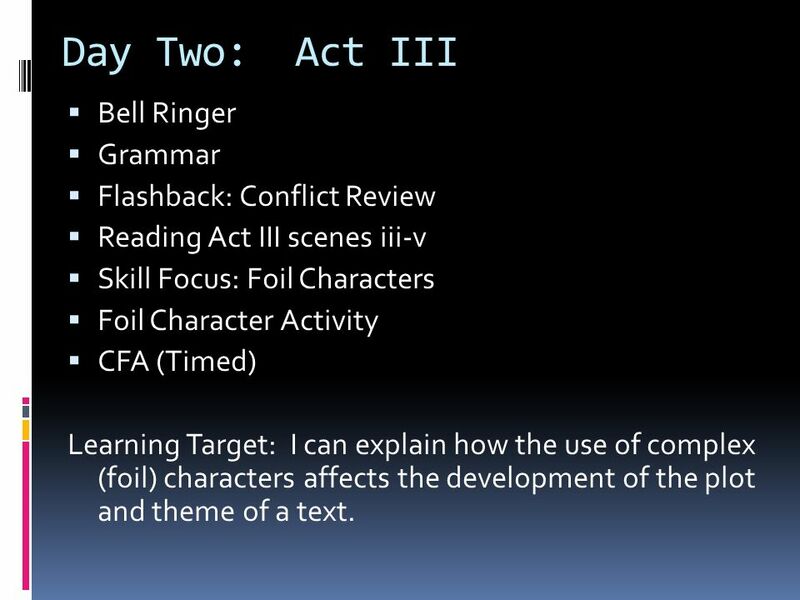 Reading Act III scenes iii-v Skill Focus: Foil Characters Foil Character Activity CFA (Timed) Learning Target: I can explain how the use of complex (foil) characters affects the development of the plot and theme of a text. 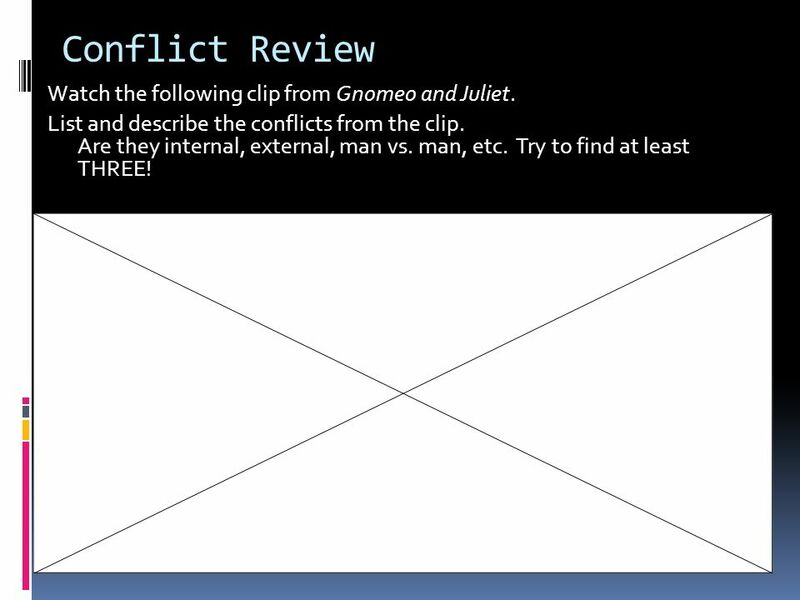 4 Conflict Review Watch the following clip from Gnomeo and Juliet. List and describe the conflicts from the clip. Are they internal, external, man vs. man, etc. Try to find at least THREE! 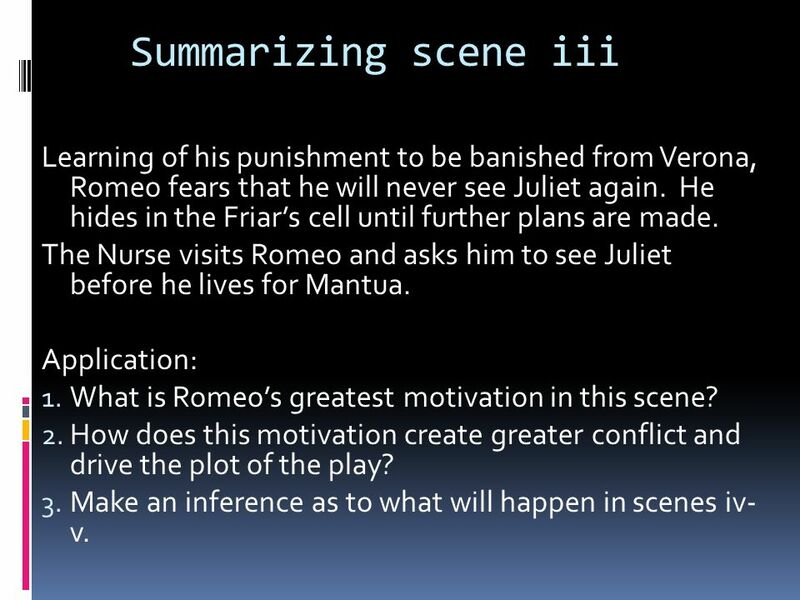 5 Summarizing scene iii Learning of his punishment to be banished from Verona, Romeo fears that he will never see Juliet again. He hides in the Friar’s cell until further plans are made. The Nurse visits Romeo and asks him to see Juliet before he lives for Mantua. Application: What is Romeo’s greatest motivation in this scene? How does this motivation create greater conflict and drive the plot of the play? 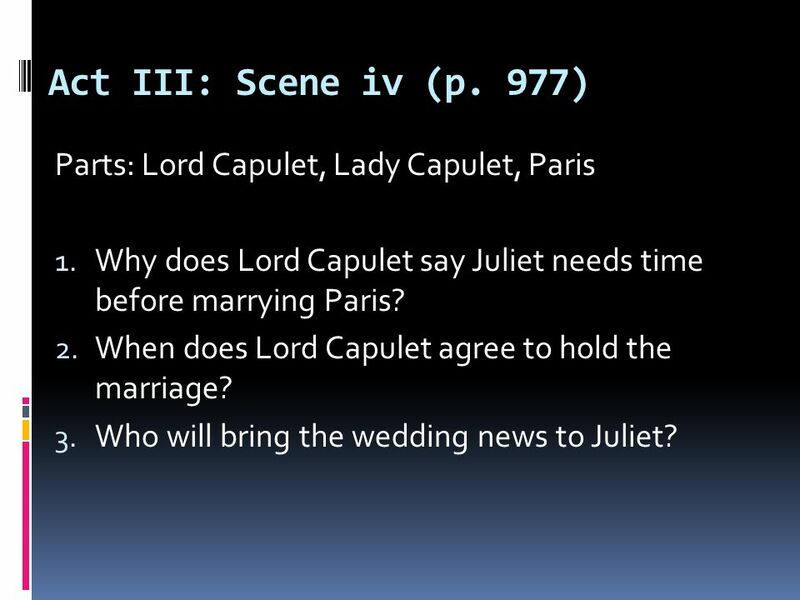 Make an inference as to what will happen in scenes iv- v.
Why does Lord Capulet say Juliet needs time before marrying Paris? When does Lord Capulet agree to hold the marriage? Who will bring the wedding news to Juliet? 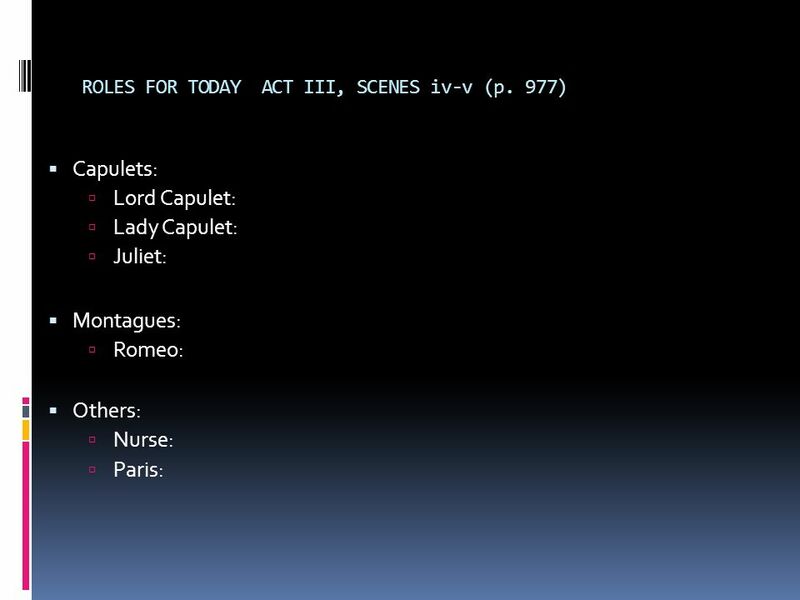 9 Act III: Scene Five (p. 979) Parts: Romeo, Juliet, Nurse, Lady Capulet, Lord Capulet What do Romeo and Juliet debate? Why does Juliet pretend to act upset? 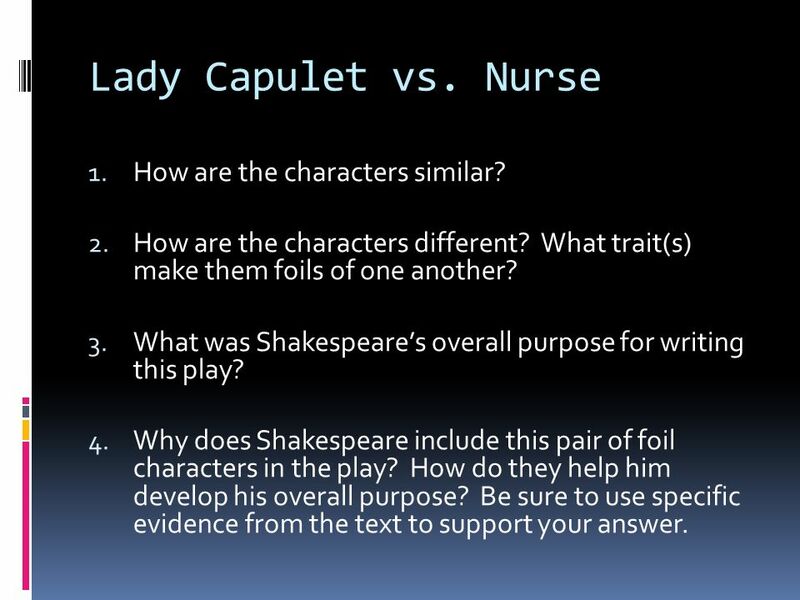 What news does Lady Capulet bring to Juliet and how does Juliet react? Why does Lord Capulet become angry? What will happen to Juliet if she does not marry Paris? What does Juliet ask for from her mother? What does Juliet decide to do since the Nurse will not help her? 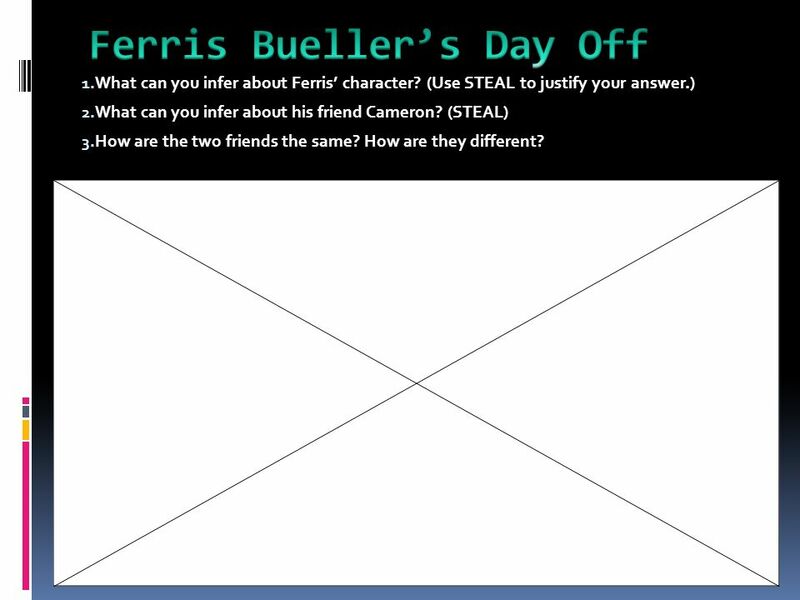 What can you infer about Ferris’ character? (Use STEAL to justify your answer.) What can you infer about his friend Cameron? (STEAL) How are the two friends the same? How are they different? This is the scene that introduces Ferris’s very depressed friend, Cameron. 12 Character Foils A Character Foil is a character who is used to as a contrast to another character. 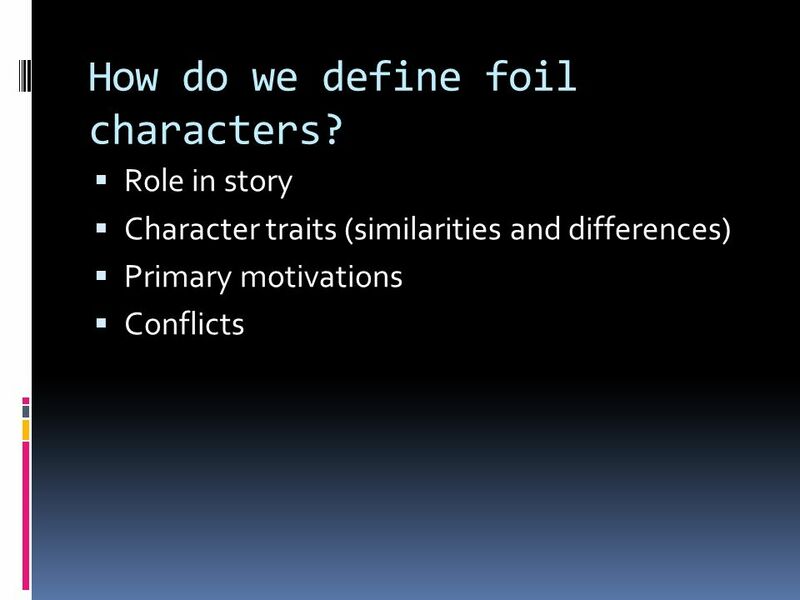 A writer uses a foil to distinct the qualities of two characters. 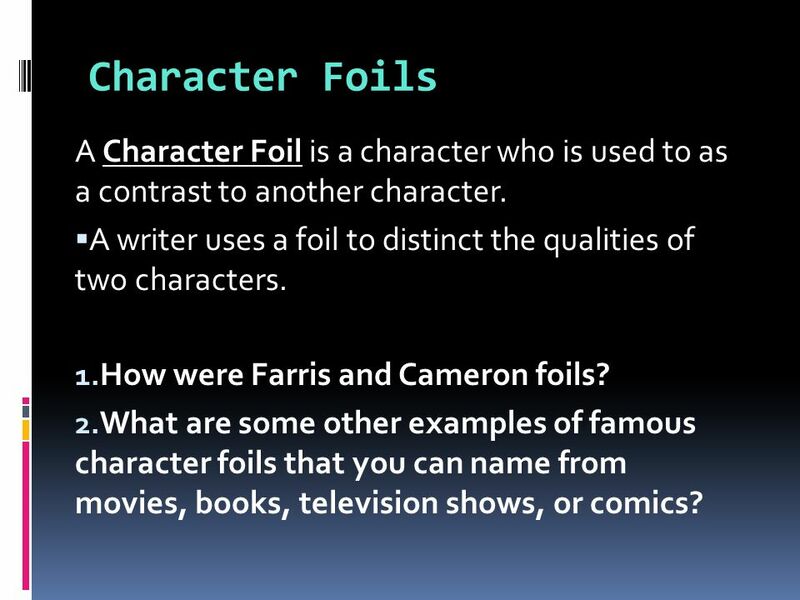 How were Farris and Cameron foils? What are some other examples of famous character foils that you can name from movies, books, television shows, or comics? 14 How do we define foil characters? Juliet’s mother, royal member of the Capulet family, minor character Juliet’s nurse and confidant, works for the Capulet family, more significant minor character Traits/Characteristics bossy, rude, stuck up, aggressive, regretful funny, crude, understanding, loving, supportive Primary Motivation She wants Juliet to marry into a good family and have a happy life. She wants Juliet to be happy and marry who she wants (even if she doesn’t personally agree with her choice). Conflict(s) in the story Lady Capulet vs. Montagues, vs. Juliet, vs. Lord Capulet She also struggles internally with her decision to force Juliet into marriage. 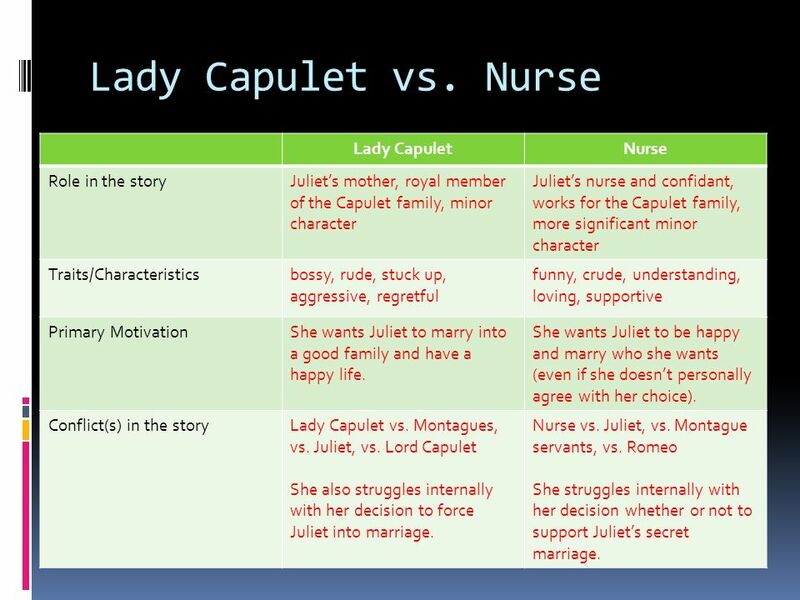 Nurse vs. Juliet, vs. Montague servants, vs. Romeo She struggles internally with her decision whether or not to support Juliet’s secret marriage. 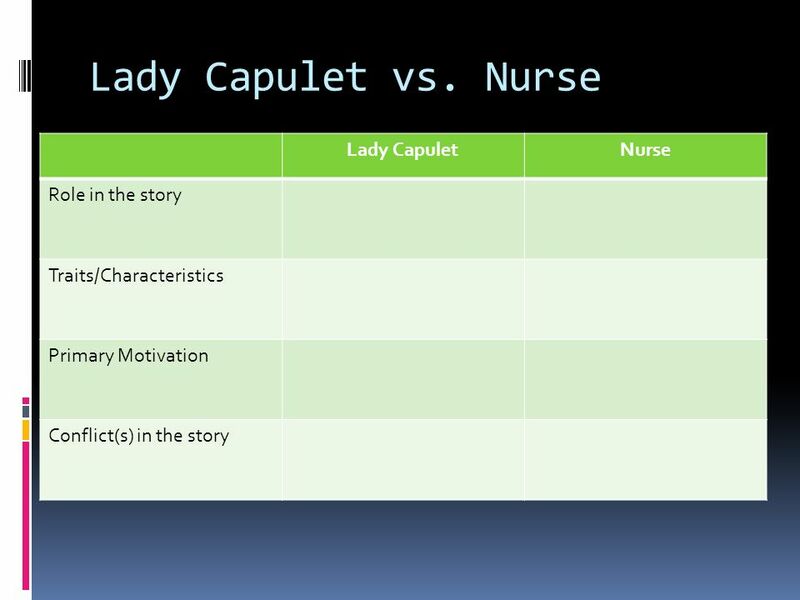 17 Lady Capulet vs. Nurse How are the characters similar? How are the characters different? What trait(s) make them foils of one another? 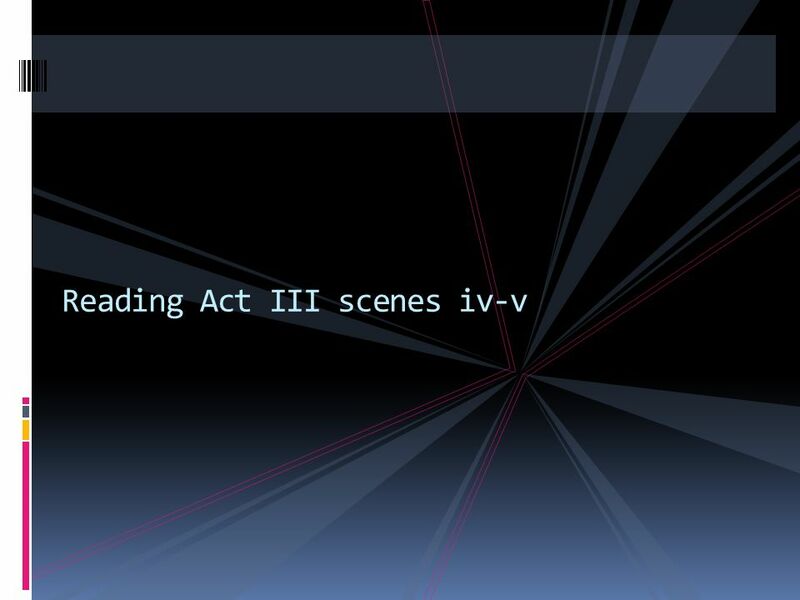 What was Shakespeare’s overall purpose for writing this play? 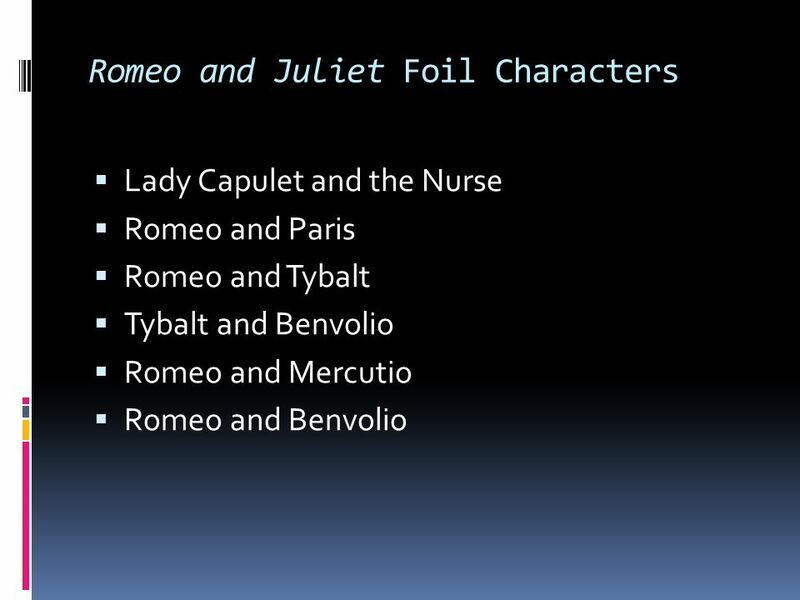 Why does Shakespeare include this pair of foil characters in the play? How do they help him develop his overall purpose? Be sure to use specific evidence from the text to support your answer. 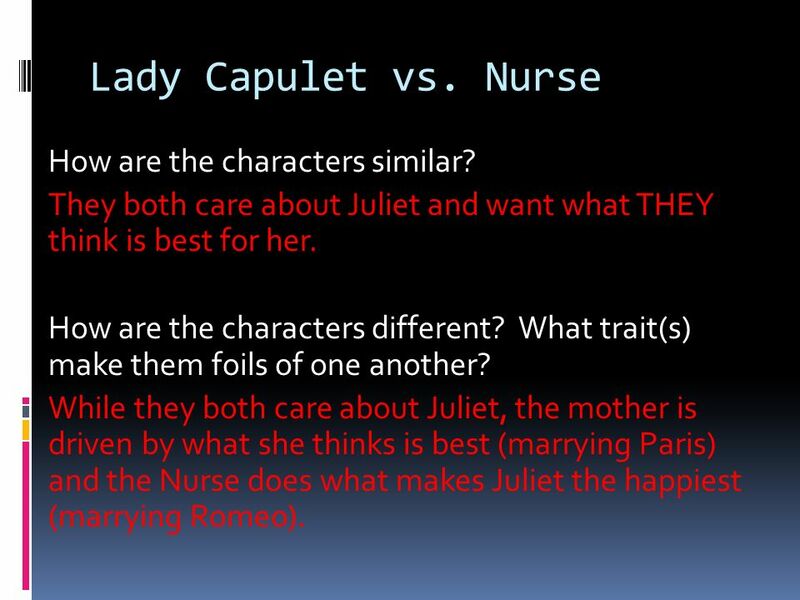 18 Lady Capulet vs. Nurse How are the characters similar? They both care about Juliet and want what THEY think is best for her. How are the characters different? What trait(s) make them foils of one another? 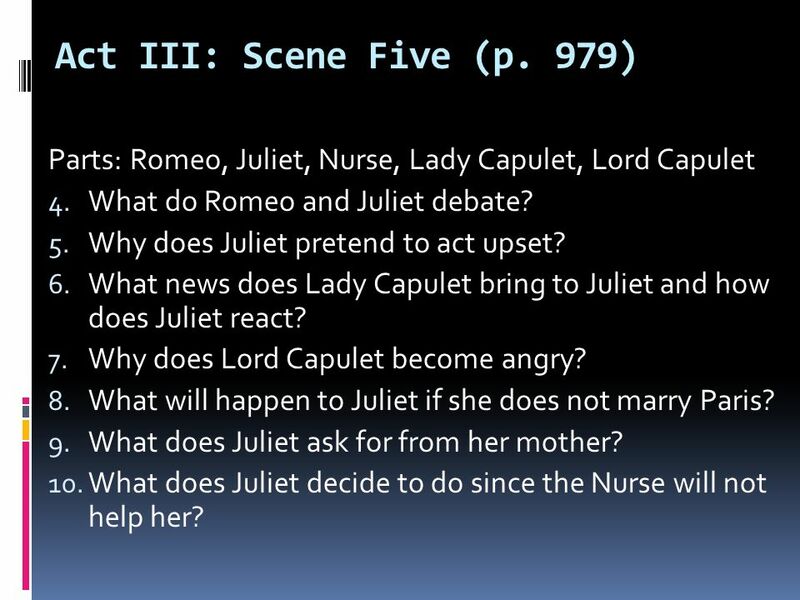 While they both care about Juliet, the mother is driven by what she thinks is best (marrying Paris) and the Nurse does what makes Juliet the happiest (marrying Romeo). 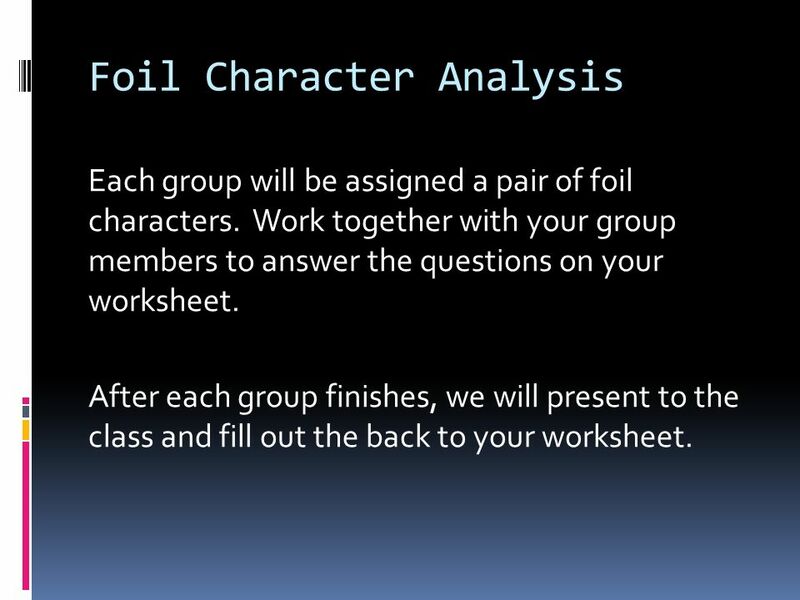 Each group will be assigned a pair of foil characters. 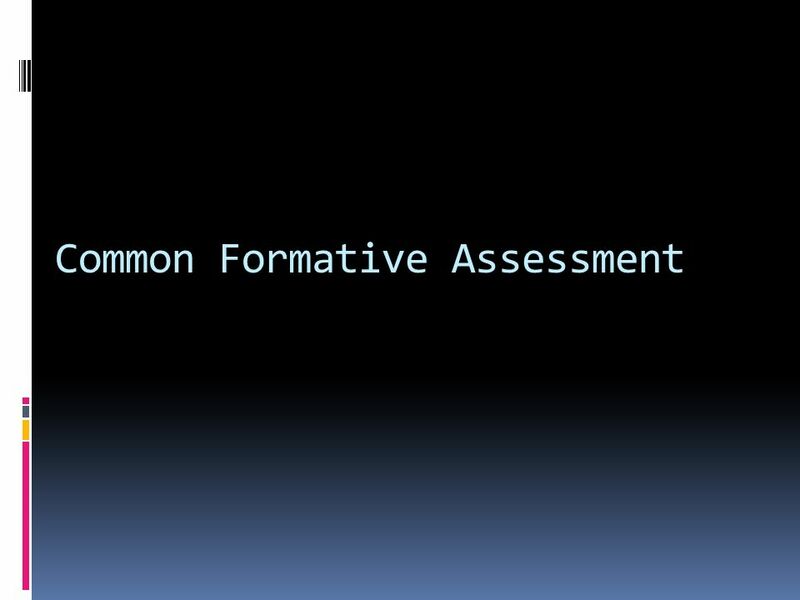 Work together with your group members to answer the questions on your worksheet. After each group finishes, we will present to the class and fill out the back to your worksheet. 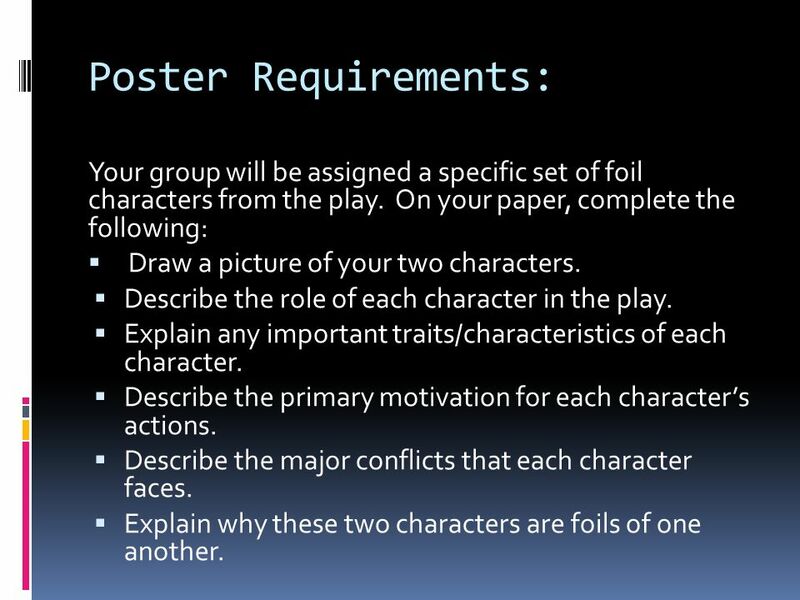 20 Poster Requirements: Your group will be assigned a specific set of foil characters from the play. On your paper, complete the following: Draw a picture of your two characters. Describe the role of each character in the play. Explain any important traits/characteristics of each character. Describe the primary motivation for each character’s actions. 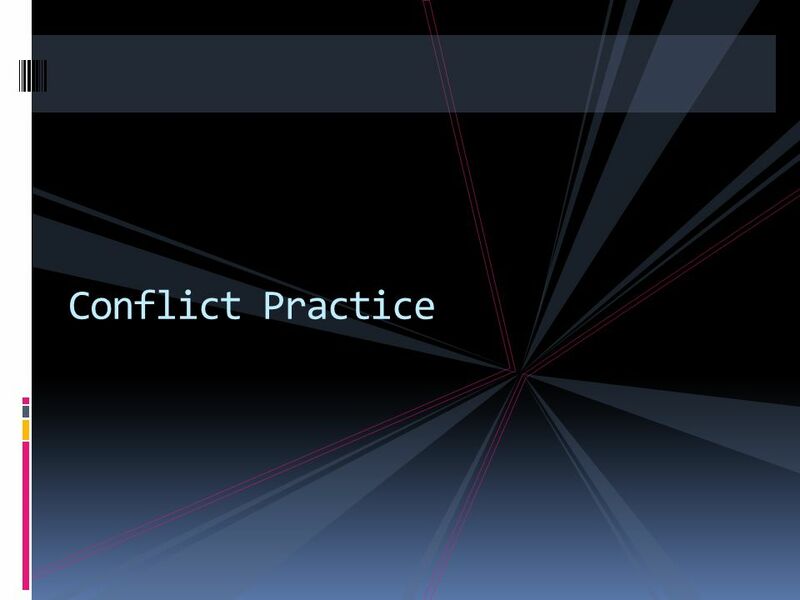 Describe the major conflicts that each character faces. Explain why these two characters are foils of one another. 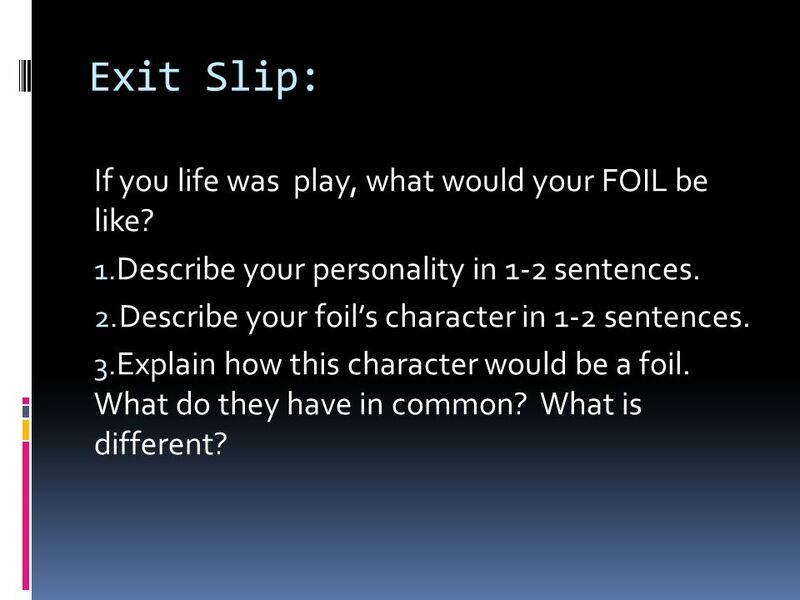 21 Exit Slip: If you life was play, what would your FOIL be like? Describe your personality in 1-2 sentences. Describe your foil’s character in 1-2 sentences. 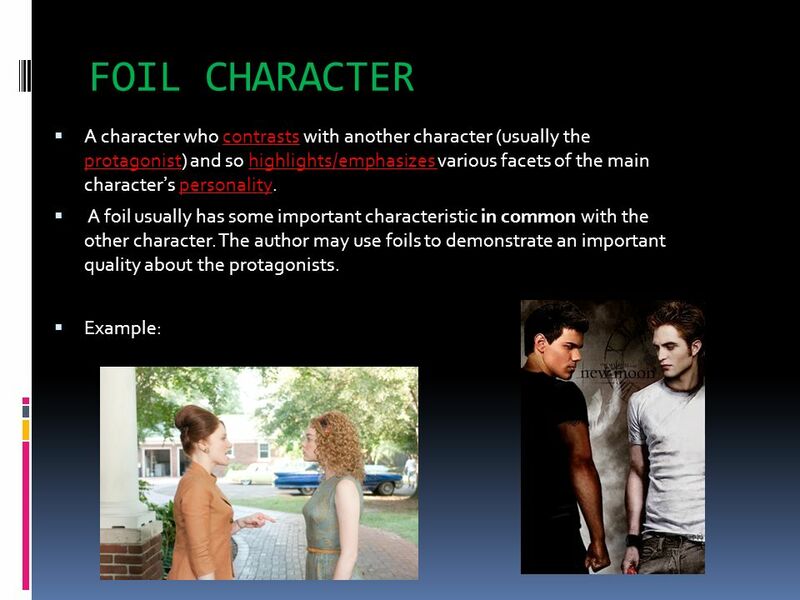 Explain how this character would be a foil. What do they have in common? What is different? 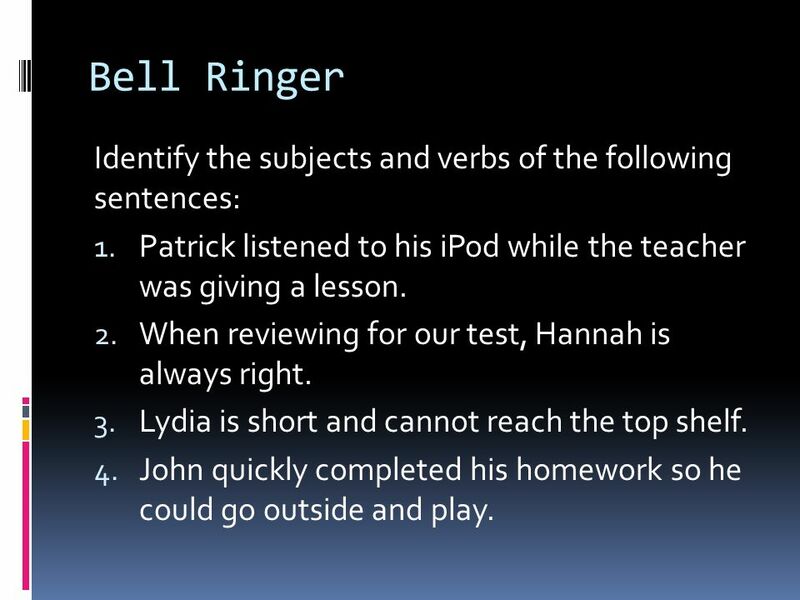 Download ppt "Bell Ringer Identify the subjects and verbs of the following sentences: Patrick listened to his iPod while the teacher was giving a lesson. When reviewing." Bell Ringer #5 For what reasons would you or members of society hold Romeo and Juliet responsible for their own deaths? Who else might you hold responsible. D AY S IX. B ELL R INGER #6: (A) 1/28 & ( B ) 1/31 Romeo spends a majority of his time during the beginning of the play ignoring his friends, walking. By William Shakespeare 5/15/ ROMEO AND JULIET. How can Mercutio be described as a foil to Romeo? “Romeo and Juliet” (1594 - 1595). STUDY QUESTIONS 1.What theme is at the centre of the play? It is the young people who die in the play, and their deaths.